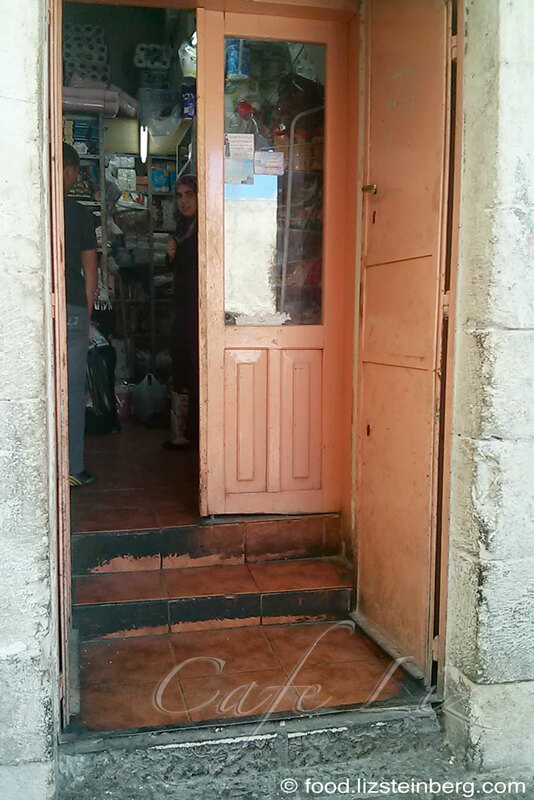 After a few wrong turns that led us up and down the bleached stone staircases of Jerusalem’s Old City, we’d found ourselves standing outside what looked like a small convenience store. There were no other storefronts in the immediate vicinity. The nutty smell of sesame was everywhere. But where was the tahini mill we’d come to find? “Where do we buy tahini?” we asked. “Right here,” said Ishak Jebrini, inviting us inside. 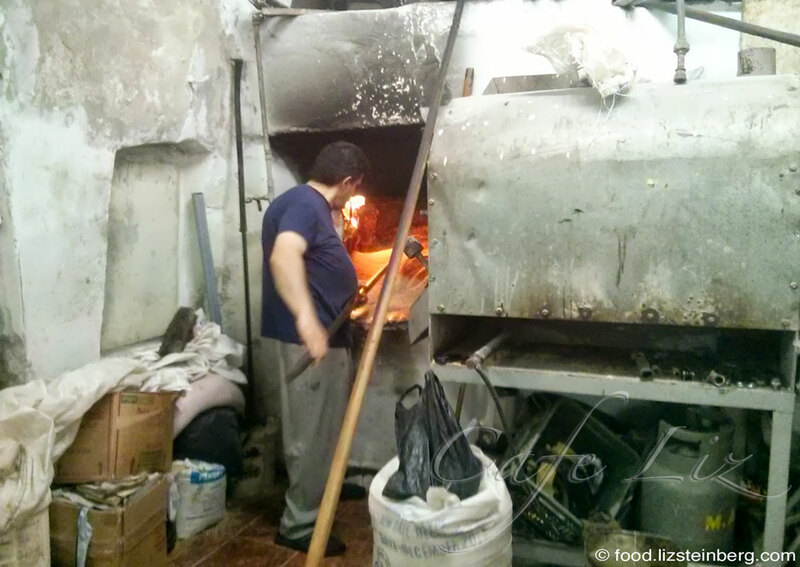 We were at one of the two tahini mills we’d be visiting during a day in Jerusalem last week. This is a tale of two little Jerusalem establishments, old and new, Jewish and Muslim, prominent and hidden. Two places that do things the slow way, the less profitable way. Their products are available only through their stores. 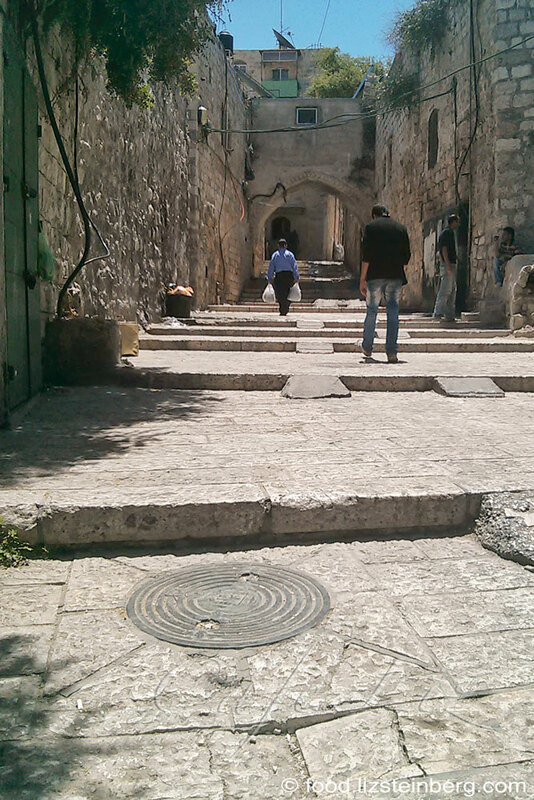 Daniel and I had gone to Jerusalem to visit Ariella, and as is our wont, we were shook-hopping. First stop was the central Mahane Yehuda market, in the middle of the Jewish part of town and a quick 10-minute walk from the bus station. 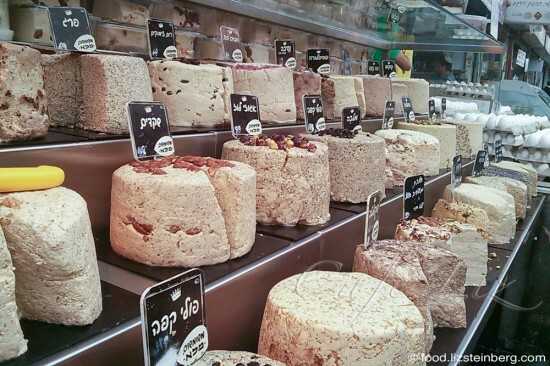 There, we stopped at the recently expanded Halva Kingdom store (Mamlechet Hahalva). One of the market’s most noticeable stands for years, with dozens of kinds of halva prettily arranged for sale, they opened a storefront just last month, named Tahini King. Halva Kingdom has been around since 1947, originally based in the Old City. They sold tahini, too, but it didn’t receive such central placement among their sesame-based sweets. Until now. Despite the impressive-looking tahini mill at the new storefront, apparently the Halva Kingdom does most of its manufacturing at its factory at the nearby Mishor Adumim industrial zone. Flavored tahini isn’t exactly a traditional product, I should note. Much like hummus, you won’t usually find tahini being sold premixed with other spices, such as cilantro or pesto, to name a few of the flavors I spotted at the store. And to be honest, since tahini is a raw ingredient, I’m not entirely sure why I’d want an entire bucket of it flavored with some spice that I could add on my own — unless, perhaps, I were to encounter a flavor I really, really liked. Generally, I serve my tahini the traditional way, whipped with water to make a light, thick emulsion and with garlic and lemon for flavor (i.e. the prepared tahini sauce you find in the refrigerator cases). That’s what most people do around here. But who knows, maybe there’s a market for flavored tahini, and in any case you can still get regular raw tahini from these masters of sesame-based snacks. In any case, there’s something particularly appealing about seeing these hundreds of containers of tahini lined up for sale, and maybe that’s what they were banking on. 12 Etz Hahaim, the main covered market street in Mahane Yehuda. Kosher. 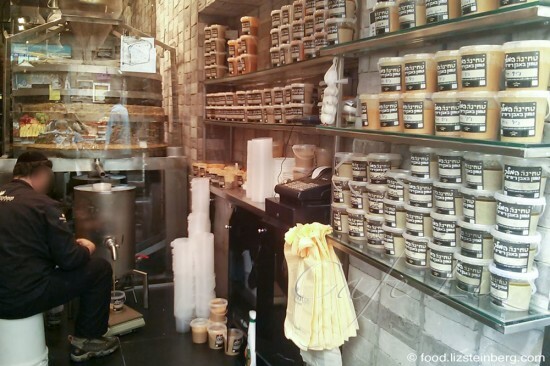 More on Halva Kingdom/Tahini King: New store opening (in Hebrew); about the store in English. Not too far away from Jerusalem’s Mahane Yehuda market is the Old City — less than 10 minutes by light rail. We got off the train, heading down the many flights of stairs that lead up to the towering Damascus gate, into the bustling market of the Muslim quarter. We were heading to Jebrini’s tahini mill, but even if you know where you’re going, you still may have trouble finding it. You won’t find this place by accident, but once you’re there, it’ll be clear that this was your destination. Jebrini’s little business looks like any other convenience store, unless you peak through the door into the back room. Suddenly you realize that this little storefront is hiding an ancient tahini mill nestled into the Old City’s stones. As if he’d been waiting for us, friendly Ishak took us into the back room and showed off the full operation. The floor was slippery from sesame oil. It’s fair to say he had been waiting — not necessarily for us, but for the many visitors who come to see the traditional tahini-making process. Little bowls of his various raw tahinis were already set out on the table — white tahini; hard-to-find red tahini, which tastes richer and smokier than the more familiar white, in a way somewhat reminiscent of coffee or even peanut butter; and black tahini, made from ground nigella seeds. Nestled against my chest in the baby carrier, Daniel happily swiped sesame crumbs from the table into his mouth. Stepping past massive bags of sesame, Ishak pointed out his mill’s 200-year-old basalt millstones, which are too slow for commercial tahini mills but produce the best quality tahini, he said (Photo at the very top of the post — in the background is a school group waiting to see the process). Nearby were huge metal vats where they rinse and hull the seeds. A few meters from us, in the back of the room, heaps of sesame were roasting in a massive stone oven, under constant supervision and stirring (photo above). They were on their way to becoming red tahini, which meant that they would be roasting for a full eight hours — as opposed to the two hours that they’d roast sesame to make regular tahini, Ishak explained. That meant many more hours of stirring for the man standing next to the open oven. “What does he think about that whole time?” Ariella wondered. In the photo: Jars of Jebrini’s red and white tahini. His white tahini is a tan color, and it will never be as white as some commercial tahinis — because they mix their products with limestone, Jebrini claims. (While he considers adulterating tahini to be a bad thing, the limestone may actually make the tahini an even better source of calcium.) His tahinis are of such good quality that they won’t separate to leave hard clumps at the bottom, and they’ll keep unrefrigerated for three years, he says proudly. He also sells the perishable solid sesame residue left over from making sesame oil — mix it with sugar and you have a halva-like snack, though it keeps for less than a day. The little tahini mill was gearing up for Ramadan, Ishak noted. After prayers, there would be a line around the corner. Customers come from near and far for the raw tahini, which flows from faucets in the store out front. One man comes from Haifa and buys 10 liters a month, he said. After tasting the tahini, I can see why. Al Malawiyeh street, several dozen meters up the stairs after you pass the sign that says Green Door Pizza Bakery, inside the Damascus Gate. Ishak invites lost visitors to call him at 02-6274816. No kashrut certificate. More on the tahini mill in Hebrew and English, and a relatively accurate map (also Hebrew). 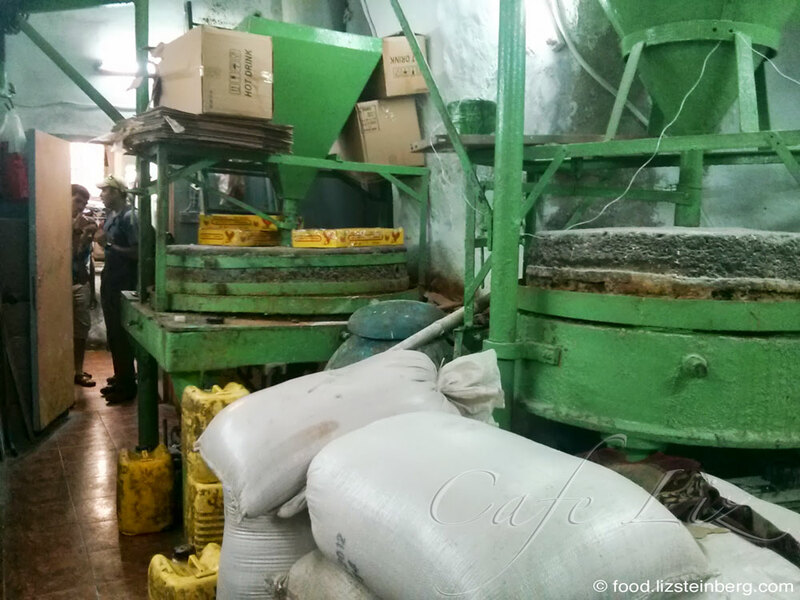 Also: A video of the tahini mill, shot by a tour guide. 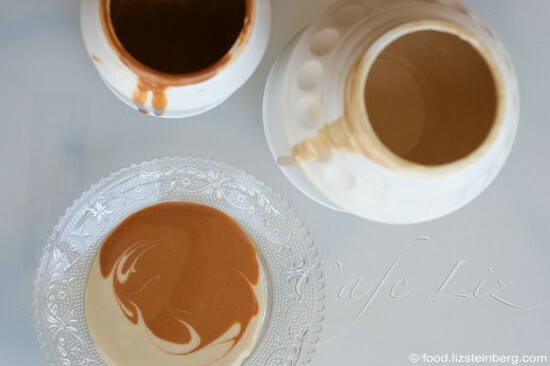 Jebrini’s red and white tahini. 13 Responses to "A tale of two tahini mills"
Thanks for this interesting tour, Liz. I’ve always wanted to see how tahini is made, the old-fashioned way. 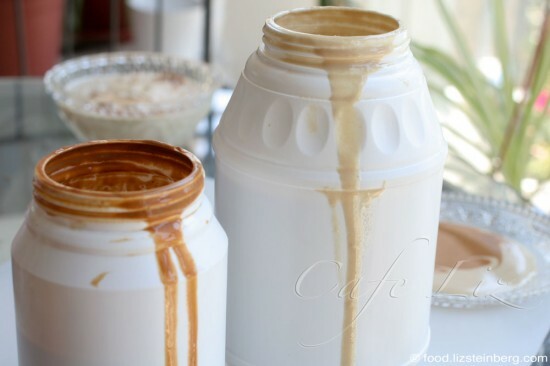 You make your own tahini? How did you toast the sesame? I toasted the sesame on a low heat in my mini oven.. 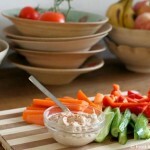 I put a picture of the toasted tahini in my blog post. Thanks Miriam, we missed you last week! So the red tahini is made with roasted sesame seeds? Interesting about the nigella tehina, reminds me of the niger seed paste the Ethiopians make. After the raw food evening, not surprised that Yael makes her own tehina. Loved the red tehina and really need to make a visit to Jerusalem. I’d love to go there with you sometime, we really should go more often. I’ve had black nigella tahini before but I wasn’t a huge fan — too bitter for my taste. Been there! THE BEST tahina ever!!! Lack of time has made me late, but thank you for the journey and the lesson! 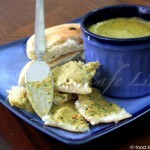 Love and use tahini often and am pretty peagreen as I surely don’t have such wonderful local sources . . . do sometimes venture to make my own . . . Thought I posted a reply (maybe on your fb page?). Anyway, spoke to my son in Israel the other day, telling him next time we come out we have to visit this tahina shop in the Old City, when he interrupts, telling me he knows of a place there with a really old grinding stone! does anyone know what kind of surface the basalt stone needs to have to mill the sesame seed? Hi. 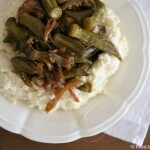 Could you tell me if they mix tahini with some flour when roasting? Thanks.